In Germany, Construction Has Begun On Controversial New Russian Gas Pipeline Construction began in May on the Nord Stream 2 pipeline, which will enable Russia to boost its natural gas exports to Europe. President Trump has warned that it will make Germany "captive to Russia." 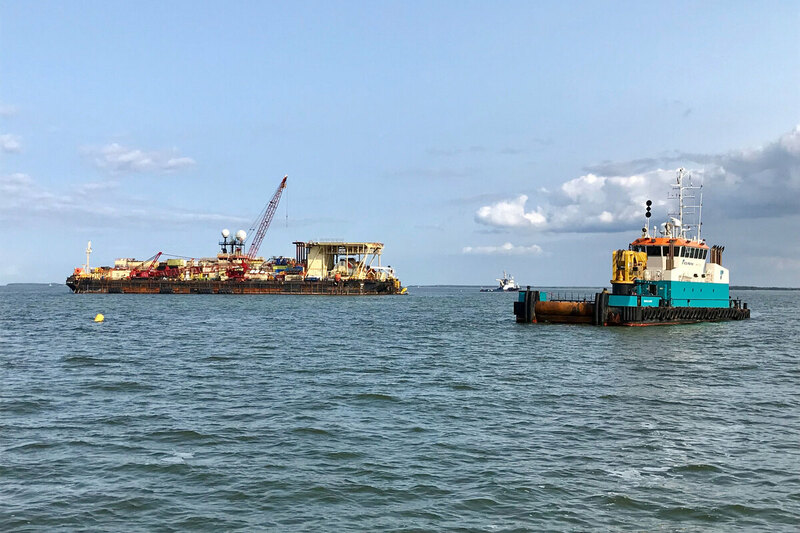 An offshore installation barge welds segments of the Nord Stream 2 pipeline, to be laid on the seabed near Lubmin on Germany's Baltic coast. The quiet beach resort of Lubmin on Germany's Baltic coast has long been an energy hub. Just a mile from the pier are the remains of what was once East Germany's largest nuclear power station. Now the town is the entry point for natural gas from Russia. Construction began in May on a new pipeline that will enable Russia to increase its natural gas exports not only to Germany but to other countries in Europe as well. The gas will be supplied by Russia's state-owned Gazprom. Lubmin's Mayor Axel Vogt is delighted. "This gas pipeline is of huge significance for the region," Vogt says. "Our small industrial harbor is earning a lot of money because of it." Axel Vogt, the Mayor of Lubmin, welcomes the Nord Stream 2 pipeline and says it's of huge significance for the region. But relations between the European Union and Russia are at an all-time low, and many EU countries agree with President Trump's warning in July that the private, commercial pipeline project known as Nord Stream 2 will make Germany "captive to Russia." However, the German government gave the final go-ahead for the pipeline's construction earlier this year. The Soviet Union began supplying gas to Germany in the 1970s, and Germany now gets roughly 40 percent of its gas from Russia, according to the German Federal Association of Energy Economy. The Nord Stream 2 pipeline, following the same route as an existing pipeline known as Nord Stream, will double Gazprom's current supply capacity to Europe. While this worries many in the EU, Vogt is not perturbed. "I'm not afraid of Russia," he insists. "Look, here in former East Germany, we grew up close to Russia. Many people here still have a deep connection to former Soviet states or directly with Russia." But Germany's eastern neighbors are especially nervous about relying on Moscow for energy. After decades as Soviet satellite states, their distrust of Russia runs deep. Poland and the Baltic states fear being at Russia's mercy and worry it could increase gas prices — or turn off the tap. Just 50 miles east of Lubmin is the Polish border, and terminals are being built on the Polish coast to receive liquefied natural gas from Qatar, the U.S. — anywhere but Russia. 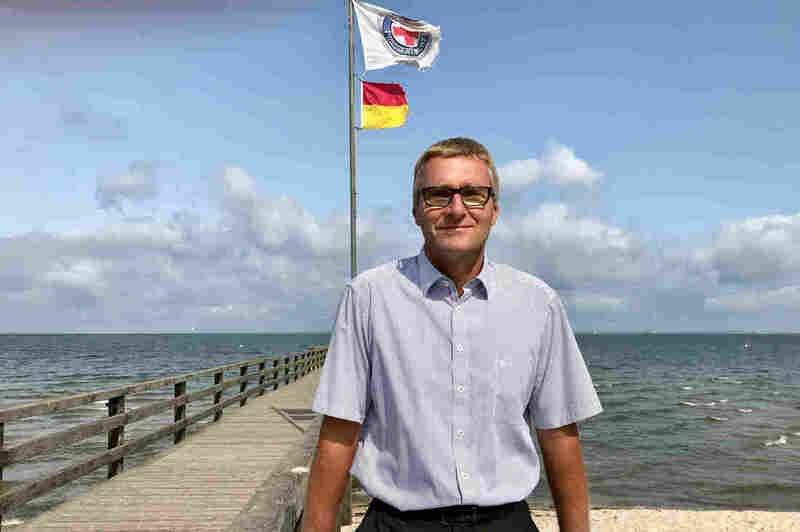 Norbert Röttgen, a politician with Germany's ruling Christian Democratic Union, is one of few in the government to criticize Nord Stream 2. He says he is concerned about Germany's relationship with its neighbors. Röttgen argues that Nord Stream 2 is a political move by Moscow, intended to deprive Ukraine of the revenue it makes from transporting Russian gas through its territory. German Chancellor Angela Merkel recently started to voice her own concern about the damage the pipeline could do to Ukraine's economy. Speaking before a bilateral meeting with Russian President Vladimir Putin in August, Merkel said: "In my view, Ukraine must continue to play a role in transporting Russian gas to Europe, even once Nord Stream 2 is operational." But Berlin still rejects the notion that the project is in any way political. Merkel's spokespersons have repeated the same line again and again. At a recent government press conference, deputy spokesperson Ulrike Demmer stressed, "Nord Stream 2 is purely an economic endeavor." But, Röttgen argues, "It cannot be that a matter that in Poland and the Baltic States is perceived as a matter of national security, is identified and characterized by the German government as a non-political topic." Reinhard Bütikofer, who represents Germany's Greens in the European Parliament, notes that former German Chancellor Gerhard Schröder has been pushing Nord Stream in Germany for years. Schröder paved the way for the first pipeline, Nord Stream 1, in 2005, while he was still in office. In 2006, after leaving office, Schröder became chair of Nord Stream's shareholders' committee, a post he still holds today. Bütikofer says Schröder continues to holds sway in Germany's Social Democratic Party. "It's been a political project from the very beginning. It's part of a very clear geopolitical strategy of the Russian government," Bütikofer contends. "If you look at the high level of involvement of government officials in Germany, it's just a lie." Out in the Baltic Sea, ships are already laying pipes on the seabed to transport Russian gas. Surveying the work from a boat nearby, Steffen Ebert, a spokesperson for Nord Stream 2, says that Europe's own gas reserves are running out and that all of Europe – not just Germany – stands to profit from the new pipeline. "Russia has been sending gas to Europe for a at least 40 years and has proved itself a reliable partner, even during the Cold War," Ebert says. "Sinister stories about Russia turning off the tap are just scaremongering." Steffen Ebert of Nord Stream 2 says that Europe's own gas reserves are running out and that all of Europe – not just Germany – stands to profit from the new pipeline. With plans to reduce its fossil fuel usage in the coming years, Germany may not need Russian gas for much longer anyway. Energy expert Claudia Kemfert at the German Institute of Economic Research believes there's nothing to worry about, provided Germany sticks to its Paris climate accord commitments and the European Commission's goal to reduce fossil fuel usage by 80 percent by 2050, compared with 1990 levels. "Gas is cleaner than coal because it produces less emissions, that's for sure," she says. "But we have to see that a full de-carbonization of the whole economy means that by 2050, the gas demand has to drastically decline." Back in the Baltic, Lubmin is already preparing for the time when fossil fuels are history. 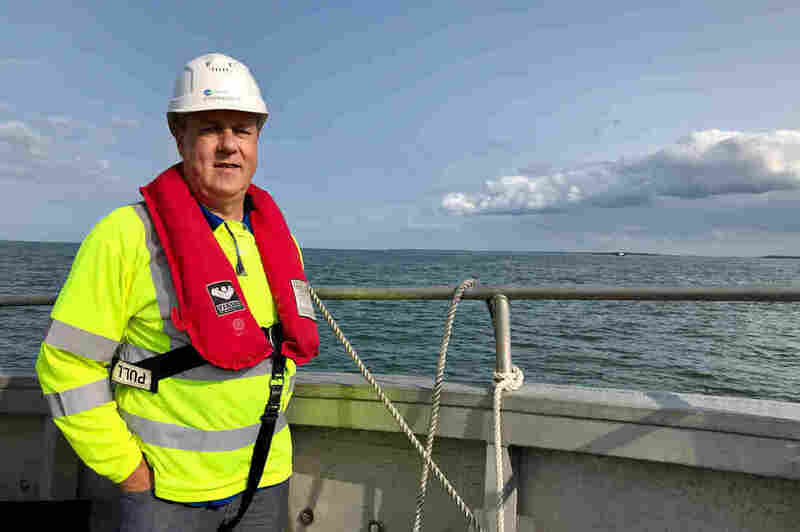 A few miles north of the new pipeline, a huge offshore wind farm is also under construction.